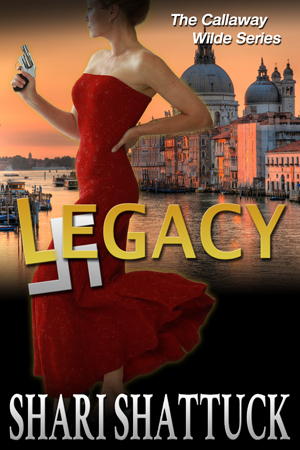 The fourth book in the Callaway Wilde series, “Legacy’ will be coming out in ebook soon. This one is a slight departure from the first three books because I break the first person narrative and visit the past. The subject is one in which I am very interested, war crimes during WW11. My uncle was one of the senior officers who was actually present at the surrender of the Germans to the Allied forces in Milan during that fateful war, and he worked for years before that undercover with the Italian resistance. So, much of my information comes from real letters and stories of people who lived it.Though my uncle is gone, his son sent me copies of letters, reports, and files that have been declassified now. The stories they hold, the drama revealed even within the factual, military reporting are inspiring and humbling. My uncle made it through that war unscathed and went on to become a Senator and then an Ambassador, but too many did not. We know this, but when we pay attention to the real stories we are reminded of what our current lifestyle cost, and who paid the price. Which is why I do not think much of people who take from the world and give nothing back. No matter how talented, wealthy, beautiful or famous. When you go through that door, as our first lady said, you do not slam it behind you. You turn around and help others through. Writing this book really got me thinking about the people that I admire in my life. While there are certainly actors or musicians whose work I adore, it is the intentions and contributions of people that matter most to me. There are artists who also do a great deal of good in the world, this separates them from the crowd of the self-serving to whom being ‘famous’ is the life goal. I admire them and others who have made a choice to be of service to someone else. People like Ileana and Bernie Geestman who founded the Desi Geestman Foundation. I have served on the board of this charity for 13 years and in that time we have assisted the families of children suffering through the cancer journey in so many ways. But what I do is small, it is Ileana and her family who truly perform the mission. To have lost a child, and then dedicate your life to helping others who are fighting that battle takes more strength of character and is far worthier of our admiration than any star of any TV show. People like the doctors and nurses at City of Hope, where our charity is primarily instrumental. In my years of helping out, I have seen again and again the sheer relief of families when they know that they have the full support and commitment of so many devoted professionals. There is a place on the grounds of City of Hope, the meditation garden, where the staff sometimes go when the stress and the sadness become overwhelming. And then they go back in. I am in awe of the hugeness of the human spirit in these people. Yet no one will ever write them a fan letter. And so it was that in my research for this book, I came across stories of so many people, forever unnamed and un-lauded who acted with such bravery and selflessness. All across Italy, including in the Vatican, Catholic priests and nuns hid the hunted Jews, often at the cost of their own lives. How remarkable. This book tells some of those stories. If I were asked what the most important traits a person could have my answer would be simple: Kindness and Courage. Those two things both compliment and balance each other. Most of us will never have to face the horrors and heart-rending decisions that even the common citizens faced during that war or many others. We would like to think that we would act with courage and honor, but we don’t really know. I think though, that sometimes it is good to stop and ask yourself, would you help? Or would you save yourself and even, possibly, profit from the suffering of others? And if your own family was starving, could anyone blame you? These were very real questions in that horrible time, often on a daily basis, but I believe that they are applicable even now. If only we would all reach out a hand, help in one small way, the world would be such a kinder place. So, I like to remind myself, I always have a choice. Will I spend my life acquiring ‘things’ and glorifying myself? Or will I do what I do for the love of it, and include as many others in my success as possible? I choose the latter. Here’s my hand, take it. Now reach back and offer yours. See? We are chain, stronger than we are alone. Next postAll the Help I Need. I was reading on your site about your cover contest and thought to myself that it was really very nice of you to have something like that to maybe give a novice a chance. Then I came upon this and see that is your style. Just wanted to say that I think very highly of this and you have given me something to really think about.